Having decided to undertake minimal planning before undertaking our holiday, other than the flights from Heathrow to Guayaquil and then onto the Galapagos with one night’s accommodation, we very pleasantly surprised with how manageable all subsequent planning was. From Baltra airport we made our way to Puerto Ayora, in Santa Cruz, using the cheapest mode of transport possible â€“ a tub of a ferry followed by a bus which struggled with the hill. Once in town and settled into Hotel Mainao we headed to Moonshine travel agency and organised our boat tour on the Galapagos Vision, a beautiful little catamaran with sails, one of which was still functioning by the end of the trip, along with only one of the two engines. Despite the last minute-ness of our booking we were offered 3 choices between two 5 day 1st class boat tours around Isabella and Fernandina for roughly $1200 and the 8 day tourist class trip around the eastern islands for roughly $850. We pitched for the latter, as while Isabella and Fernandina are considered more pristine, the tours to the east cover more islands and allow you to see more of the inter-island diversity. 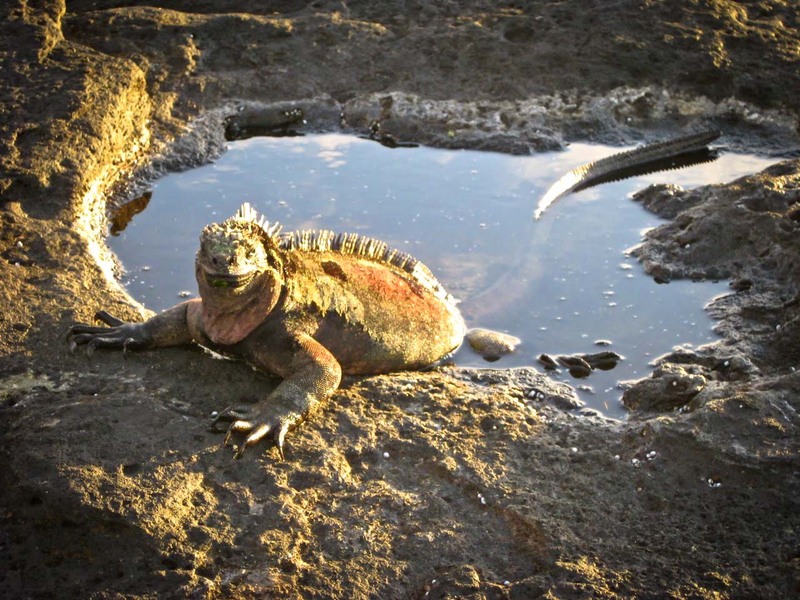 Also it included Espanola, an island with colonies of sea-lions, blue footed boobies, waved albatross, marine iguanas, hawks and doves. 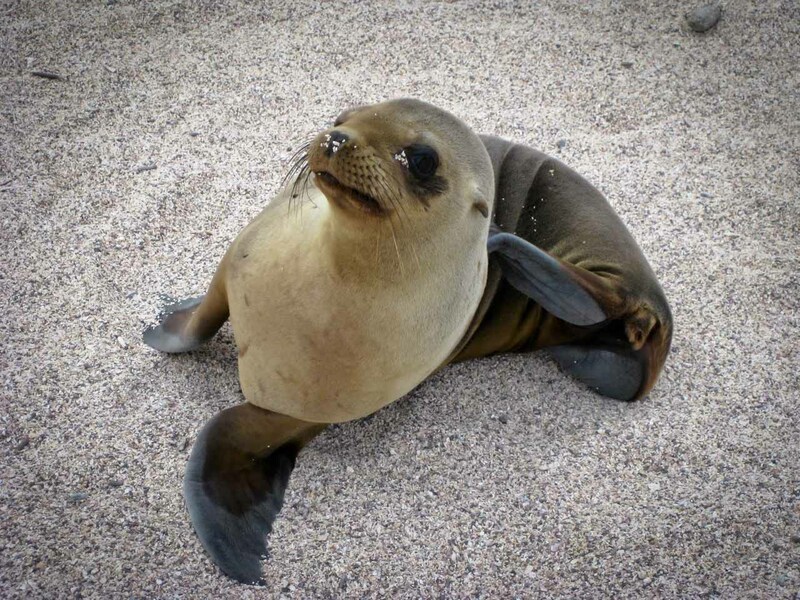 What’s more, it was baby-time on a lot of the islands, so tiny newly born sea-lion pups littered the beaches. Newborn sea-lions sound like vomiting children, which is a strange sound to wake up to on a boat. The boobies, albatross’, frigate-birds and land iguanas were also tending their respective little-ones. Another highlight, this time on Santa Cruz, were the giant tortoises. Like something from the land before time forgot, these fantastic creatures were, as their name suggests, gigantic. Being October, the tour itself, was cheaper than it would have been in the peak season, but this was balanced by the weather – which wasn’t sunny all the time, and the sea was a little rough. This played havoc one night while we attempted to enjoy Chefs great cooking. Beware though, despite the tolerable temperatures, burning through clouds at 10.30am is entirely possible at the equator. And while you have to suffer a bit in the colder Archipelago waters of the Pacific, the snorkelling is unforgettable. The turtles would glide effortlessly snatching foliage from the rocks, while the penguins zipped and bobbed around us. The sharks eyed us from the depths as the 10 foot manta ray effortlessly and majestically rose from the murky water and disappeared again like a giant black visiting bedsheet. 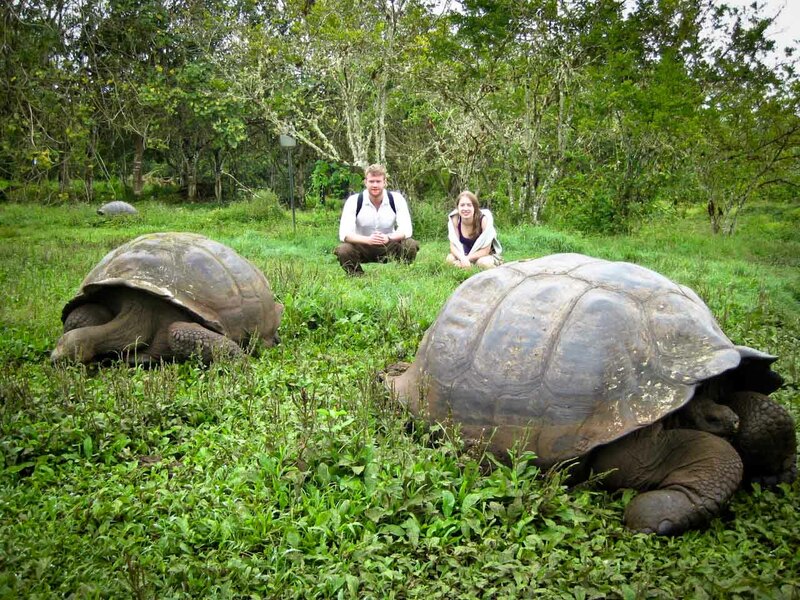 Only a once in lifetime thing, the Galapagos outlived expectations. That’s pretty spectacular considering I’ve always regarded this place as something equivalent to Mecca. We are two scientists that have just finished our PhD's and are making the most of our new free time to see some of the world. Ross loves all things sports, being active and meeting new people while MaryAnn enjoys seeing the great wonders of the world. We're based in Oxford so give us a shout if you're ever around. Thanks for your phenomenally quick help with this Andrew, I am looking forward to using CommenLuv on Planet Vagabond. Very nice first contribution Ross & MaryAnn and welcome to Planet Vagabond! Jess and I are looking forward to many more articles about your travels.